*Fashion parade was choreographed by SHIE Lobo of MTV fame. 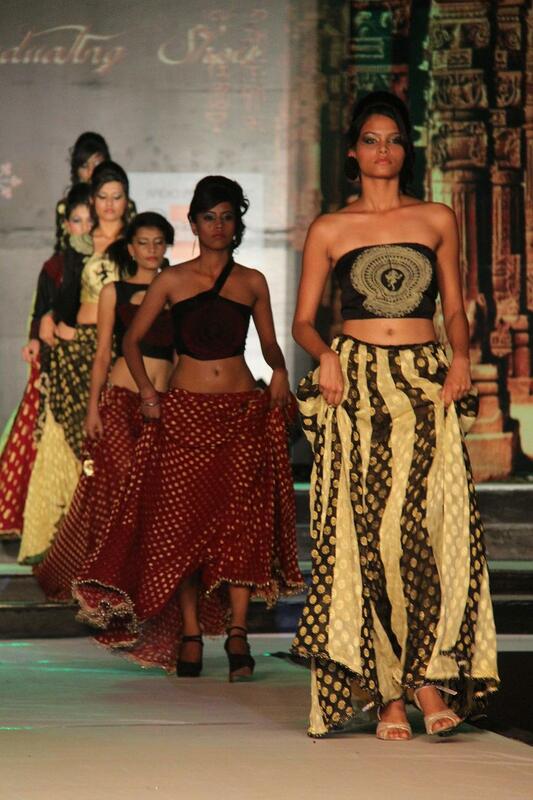 Jalandhar: LPU’s School of Fashion Technology organized mega fashion parade at its Annual Graduating Show -2013, today. The show is intended to send Industry ready final year students of M Sc & B Sc Fashion Technology in the world of fashion for sure and winning career. This year, students showcased 11 artistically designed and skillfully crafted graduation collections through their years’ learning and training. Pantaloons Femina Miss India Earth (2009) sensation Shriya Kishore was the show-stopper, and she also walked the ramp along with winners of Punjab Mega Model Hunt, models from Mumbai fashion industry & LPU students. All of them wore and displayed over 120 fabulous creative designs by University students. The last round earned wide applaud from the onlookers as it presented Future Designer Students of the University, with the display of wears-the best of students' creations. Eleven beautifully embroidered/weaved/stitched/knitted, and brilliantly crafted design collections were named separately for different rounds. These were as: Rhythm Divine, Fantastic Fantasy, Geometric Concomitance, Bohemian Crescendo, Ahoy! Pirates, Afsaane Hazaar, Jewish Jewels, Horn Please! , Re-incarnated, Infinite Significant and Matinee Masala. All were named as per inspiration first and creation thereof. Inaugurating the show, LPU Pro Chancellor Ms Rasmi Mittal encouraged the students by saying: "LPU’s new generation of fashion designers introduces itself to the fashion world every year, with an impressive fashion show like this. Such a professional exposure towards the industry serves as an excellent career entry. Moreover, such a career promises glamour, fame, success and high pay packages to the talented students. I wish a dazzling career to all students pursuing devotedly on these lines!" Talking about their experience, designer students of collection “Rhythm Divine” Amanpreet, Sonia, Rupali, Shivangi Khanka, Priya of B.Sc. Fashion Technology Final Year said: “The scene of models displaying our own creations enthralled us to the core. Our collection is inspired by mythical dancing depiction of Lord Shiva (NATARAJ). It showcases elements of anthropomorphism through repetitions and rhythmic expressions. Materials used by us for this and other collections are shiny fabrics like pure Raw Silk, linen, cotton, Chinese Dupia Silk, Georgette, Satin, Net, knitted fabrics, shimmer net, art silk, taffeta, semi silk, khadi silk etc. ” Similarly, other collections were under inspiration from classic tale “Alice in Wonderland”; Geometry Shapes; Bohemian Fashion; vicious Pirates; tales & Characters of Arabian Nights; Hebrew culture of Judaism; loud and bright colors on Trucks/Punjabi Culture; South American civilization of Incas; Microscopic algae; and, 100 years of Bollywood. Similarly, Mani Cheetu, Kamni, Raman, Babita , NikhitaMol, Hiti, Razia, Lalrinpari of M.Sc. Fashion Technology Final Year said: “ The Models’ exhibited our dresses with mix of youthful fashion, Chinese embroidery, sharp cuts, wide shoulder pads, flowing and stylish elements, floral prints, elements of rugged unclean silhouettes, layered fabrics with asymmetric details, heavily accessorized with hats, weapons, variations of Harem pants, Jackets, corsets, blouses, ponchos, headgears, cloaks, bridal wears etc. This has boosted us all to grow more towards the industry of fashion. We salute our alma mater for providing such a great platform on these lines.”Illustrative, a large number of LPU students are presently working with top brands like Monte Carlo, Tommy Hilfiger, Orient Craft, Lilliput, Metaphors, Madame, Neva Inner Wear and such many others of immense repute. Covering demonstration of the latest and top designs, this unique striking event was also fairly added by some of the famous brands through the strenuous efforts of the students. Nice Blog!!! India is the democratic and developing country. It also developed in the field of fashion as compared to other countries. There are also various Top Fashion Design Colleges in India which makes the tremendous scope for the fashion in India. The Fashion Design Institutes in India are the worlds famous institutes for the Fashion world. Nice blog and the content posted in the blog seems to very informative about fashion design colleges in India and it helped me to find out more about the fashion designing. WLCI Graphic Design & Advertising Course offers courses in visual communication, animation, advertising and graphic design. The information in your journal is incredibly informative. sustain the great work. About WLCI faculty of Fashion:Our faculty offers numerous courses and programs in Fashion Technology, that area unit terribly interactive and prepares students for real fashion world. Nice blog ,Very Informative,Keep the good work going.Keep Updating. Browse the Designerwear.co.uk sale, with many of our products like mens designer T shirts at fantastic prices with price reductions for a limited time only!